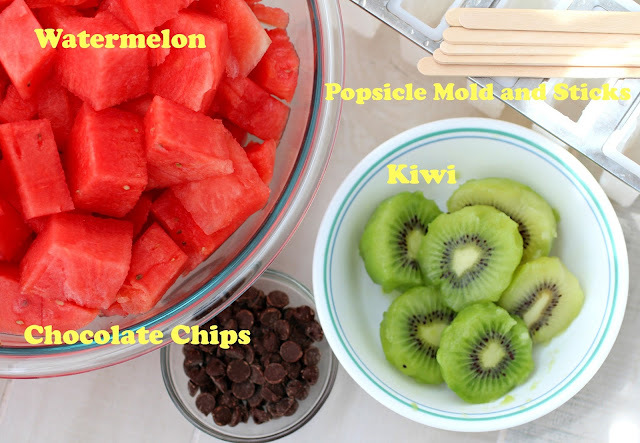 Watermelon Kiwi Popsicles are just what we need to cool off during these hot summer days! The weather is hitting the 100 degree mark these days and the humidity makes it feel even worse. I love finding tasty ways to cool off and these popsicles are fun and tasty. 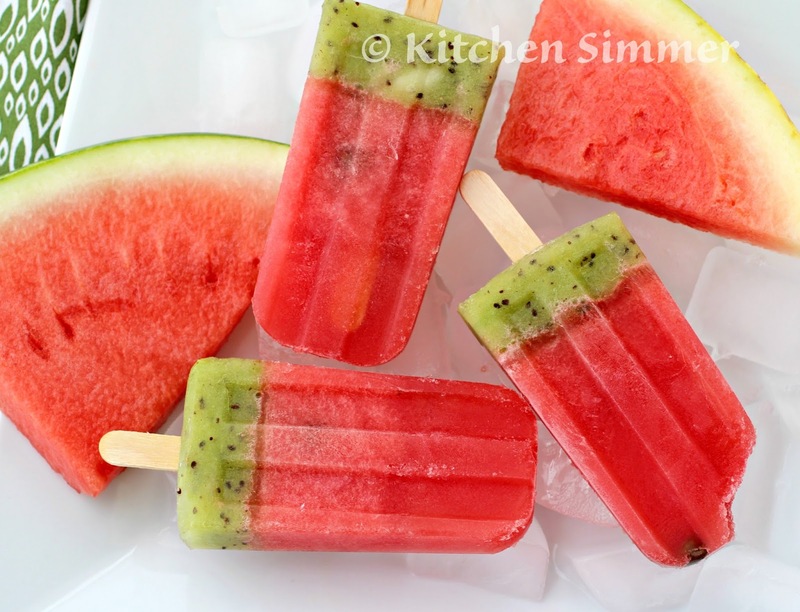 The kids and I made these watermelon pops one afternoon and we loved how they turned out. They are just so darn cute! We could not wait to try them and had our first pops right after breakfast. It was already hitting 85 degrees so we needed them. We made our pops without any sugar or simple syrup. Our watermelon was perfectly sweet enough and I loved the tartness the kiwi gave the "rind". Now, if you have a less than sweet watermelon or you just love a sugary treat, add some simple syrup. We will be eating a lot more popsicles in the upcoming days. The temperatures are staying around the 100 degree mark so we are staying close to the freezer! Step1: Cut watermelon into chunks and blend in blender until smooth. Taste puree, if it is not sweet enough for your desired taste, pour in some simple syrup and blend. To make the simple syrup, just add the sugar and water into a pot and boil until sugar dissolves and the syrup thickens. Step 2: Then pour watermelon puree into popsicle molds and leave about 1/2 inch from the top. 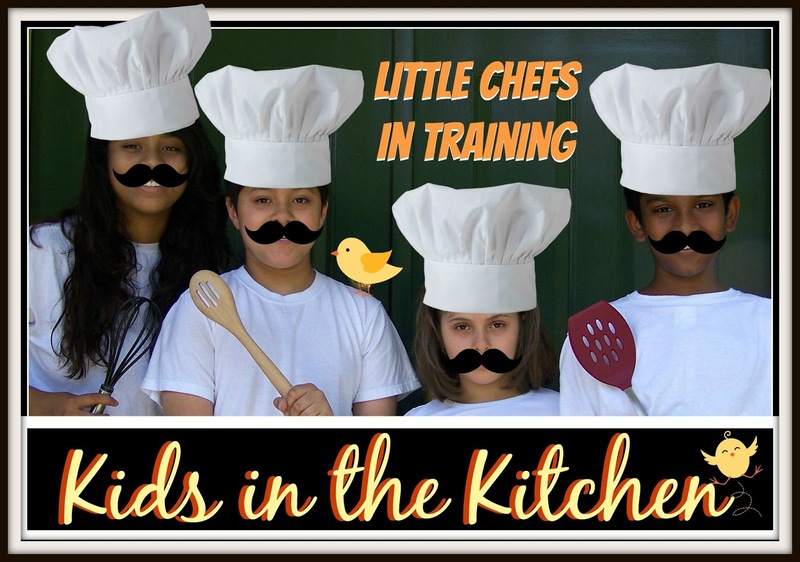 Drop a few chocolate chips for the "seeds". Place in the freezer and freeze for one hour so the watermelon has become slushy, but not frozen yet. Step 3: Prepare kiwi by peeling the skin and blending until smooth. If you prefer the kiwi puree to be sweeter, add some simple syrup and blend. 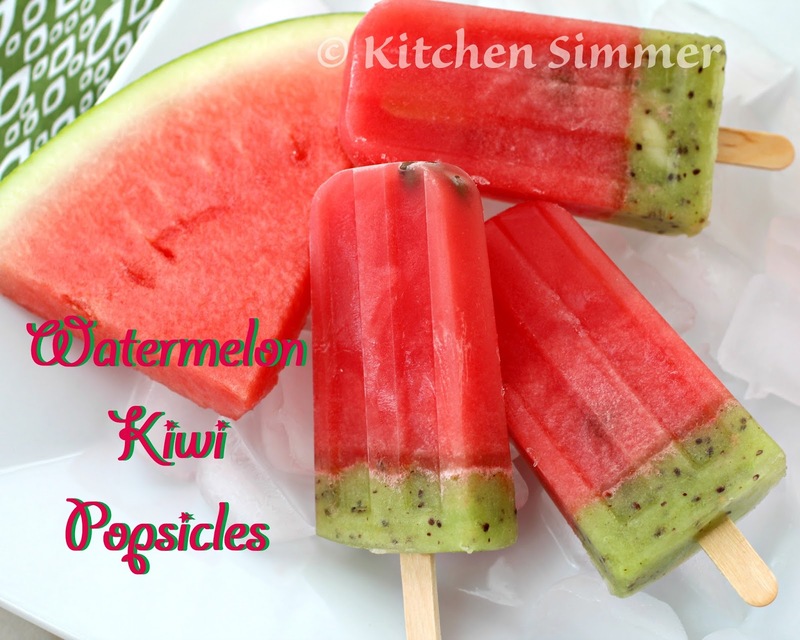 Once popsicles have set for one hour, top with the kiwi puree. Insert popsicle sticks and freeze overnight. Step 4: Run warm water around popsicle molds and release frozen popsicles from the molds. Enjoy. 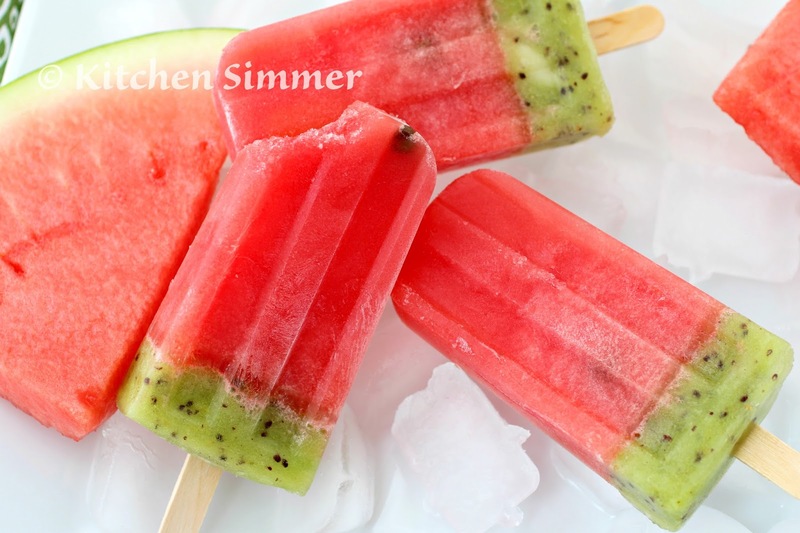 Best way to cool off with watermelon and kiwi. I would like to praise your recipe. Thanks for sharing. How pretty are these?! Time to make some popsicles!